Genie is a boss who helps Jafar during his battle with Sora and friends during Kingdom Hearts. Genie's loyalties lie with Aladdin, but after Jafar acquired the magic lamp, he used a wish to have the Genie aid him in battle. 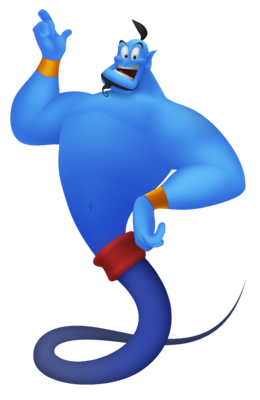 Genie appears in the battle against Jafar, but cannot actually be targeted. He acts as a guard for Jafar, and will attack Sora when he gets too close to him, these attacks will release restorative orbs afterwards. The only solution is to simply avoid Genie and go straight for Jafar, but if Sora could use the orbs, provoke an attack from Genie but dodge it.